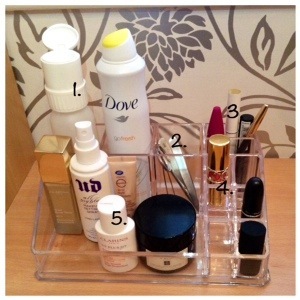 Beauty Collection Storage: Acrylic Cosmetic Holder | The Beauty Spot – The Beauty Spot. I had seen many many vlogs and beauty collection videos showing acrylic storage, mainly from Muji, so I went into a number of stores but could never see anything that I felt would work on my vanity. So I got onto trusty eBay! 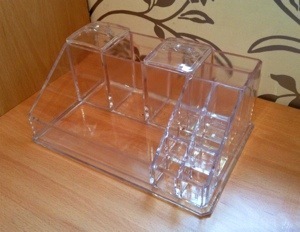 I searched acrylic cosmetic organiser and just scrolled and somehow picked one that I liked the look of. The person that was selling mine had about 10 different organisers to choose from on the same listing, so you just have to be careful when placing your order to make sure you’re going to get the one you want. I chose this one because of the different shaped compartments as I thought I could fit quite a few different things in them. I’m not very good with dimensions so I didn’t really know what I’d ordered exactly I just knew it would roughly fit in the space I had allocated. 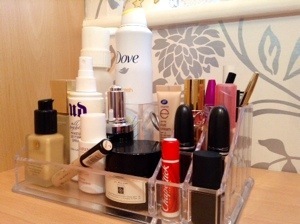 This organiser really has organised my beauty life! I just move things around if I’m using a new product or have finished one. It’s great because it’s so compact but can still fit all I need. I store my brushes next this on my vanity so they are also within easy reach, anything that is interchangeable is stored in the drawers of my vanity itself. I would recommend anyone to have a look at these on eBay, the amount of different shapes and sizes of these organisers is amazing! Another month been and gone with more lovely memories made! Hello April!